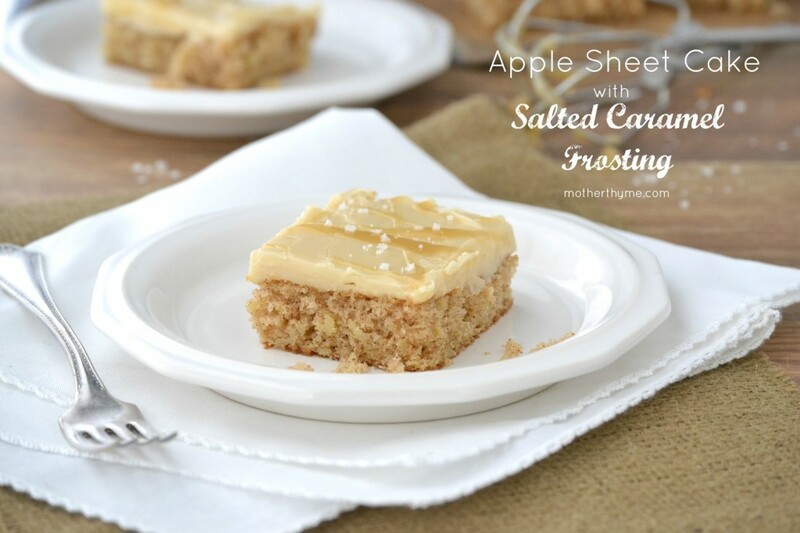 This Apple Sheet Cake is perfect for all your fall gatherings. 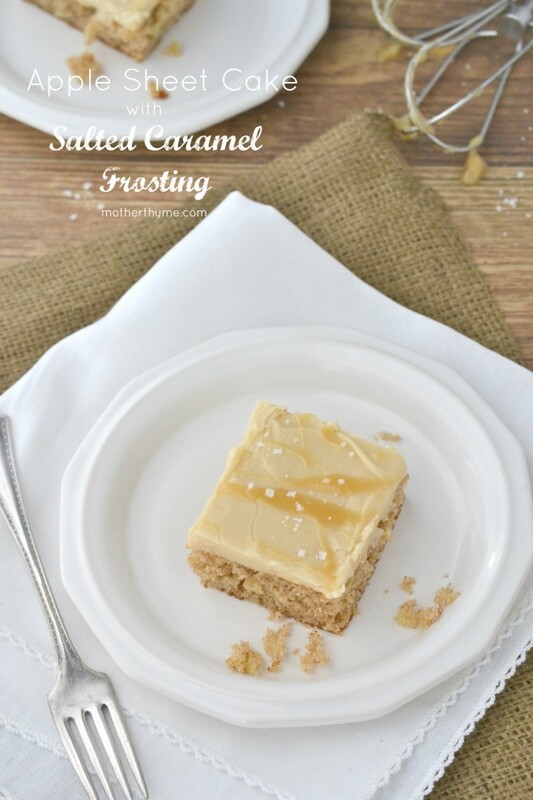 Topped with a creamy Salted Caramel Frosting, it is the perfect compliment to this delicious cake. It could quite possibly be the best stuff. Drizzle on a warm brownie, top a bowl of creamy vanilla ice cream or put in frosting. Did I just say put in frosting? This stuff is dangerous, dangerously good that is. It is the perfect compliment on this Apple Sheet Cake, among many other things. Fall is hands down my favorite time of year. From the changing of the leaves, Sunday football, to a weekend apple picking I love fall. With fall comes cozy weekends at home spending time baking with crisp apples and freshly pureed pumpkin. I can almost smell the sweet aroma in my kitchen just thinking about it. As soon as the calendar turns to September I am preparing my menu for the season with what I want to bake. I have a Pinterest board filled with a lot of fall goodies I am anxious to try along with yearly favorites I like to make. I have had an obsession with sheet cakes lately. There is something so comfy and effortless about a sheet cake. A typical sheet cake is baked in a jelly roll pan that usually measures 11″x 17″ with a 1″ rim. A similar pan or a more common 9″ x 13″ cake pan can be used instead, just adjusting the cooking time, of course. I thought an apple cake would be a great way to kick my fall baking. In this cake I shred the apples so you get flecks of fresh apple in each bite. Sure I could topped this with a classic buttercream frosting, but a caramel frosting, and a salted caramel frosting to boot is perfect. Plus who doesn’t love caramel with apples. Nothing tastes more like fall than that. Preheat oven to 350 degrees Fahrenheit. Grease and lightly dust with flour a 11" x 17" jelly roll pan and set aside. In a medium bowl combine flour, baking powder, baking soda, salt, cinnamon, cloves and nutmeg and set aside. In a large bowl using an electric mixer cream together butter and sugar. Add eggs one at a time mixing after each addition followed by vanilla extract and milk. Stir in grated apples. Gradually add in flour mixture until blended. Spread batter evenly on prepared pan and bake in preheated oven for 16-20 minutes until cake tester comes out clean when inserted in the middle. In a medium saucepan combine butter, brown sugar, half and half, and cream of tartar over medium heat stirring occasionally until butter is melted and sugar is dissolved. Bring to a boil and stir frequently for 2-3 minutes. Remove from heat and stir in salt. Let cool. Add cooled caramel, reserving 1 tablespoon in a large bowl along with about one cup of confectioners sugar. Stir using an electric mixer medium speed until confectioners sugar is combined. Continue to add in confectioners sugar in about one cup at at time. Stir in milk until creamy. Serve with an additional sprinkle of fleur de sel (optional). Note: This can also be baked in a 9" x 13" cake pan for 35 approximately 35 minutes. « Odwalla Fruit Smoothies For Kids with Weelicious! I want to go make this right now! I would love a slice!! My mom had a brownie with salted caramel frosting the other day, and on Sunday, wanted to top a spice cake with a caramel frosting. She came up with something similar to this, and it was so good. I love the apple cake – I bet this combo is killer! OOOH Jennifer, this looks AMAZING!!!! Can’t wait to see you… MM??? Do I need cake in order to make caramel frosting?! YUM!!! I love an apple cake, and salted caramel frosting?! Yes please! This is just beautiful! You make me so excited for fall!!! Oh, this sounds amazing! I’m so excited for fall goodies, and that salted caramel frosting is incredible! Oh gosh are you kidding me!? SO yummy. We took the kids for ice cream this weekend and my husband got salted caramel. We are now obsessed. this sounds so yummy and something that i want to go make right now – seriously. salted caramel atop an apple sheet cake?! totally there! It looks and sounds delicious. I love apples! Salted caramel is indeed amazing. Love these! Oh my gosh, this frosting. Adore this, Jennifer! I love sheet cakes, always have. Can’t wait to try the apple cake! that salted caramel looks absolutely perfect. paired with apples – total love! I love sheet cakes but you don’t see many recipes for them anymore. I recently made Italian meringue salted caramel buttercream and it was insane! Could you also add some diced apple the batter? i’m glad i’m not the only one that thinks salted caramel is the best thing ever. Ooh, apple and salted caramel. Nice twist on a classic. I’m diving into Autumn flavours now, but I don’t want pumpkin everything. This should do quite nicely. Thanks. I made this for a party last night. 5 people wanted the recipe. EVERYONE raved. The frosting was TO DIE FOR. Thanks! I am so happy to hear it was a hit! I made this cake for a Halloween party. LOVED IT! Loved everything about it. Thank goodness I made the sheet cake because I had left-overs that I put in the freezer and have enjoyed for the past 3 nights! For all of you who say, ” Sounds great” GET TA BAKIN’. You won’t be disappointed. I was so happy to have found this recipe, and it was so easy and the results were soooo good!!! I have used this frosting for a few different things now and it is always such a hit! Both recipes are written in my book of faves and will definitely be used again. Thank you!!! So happy to hear you enjoy these recipes! 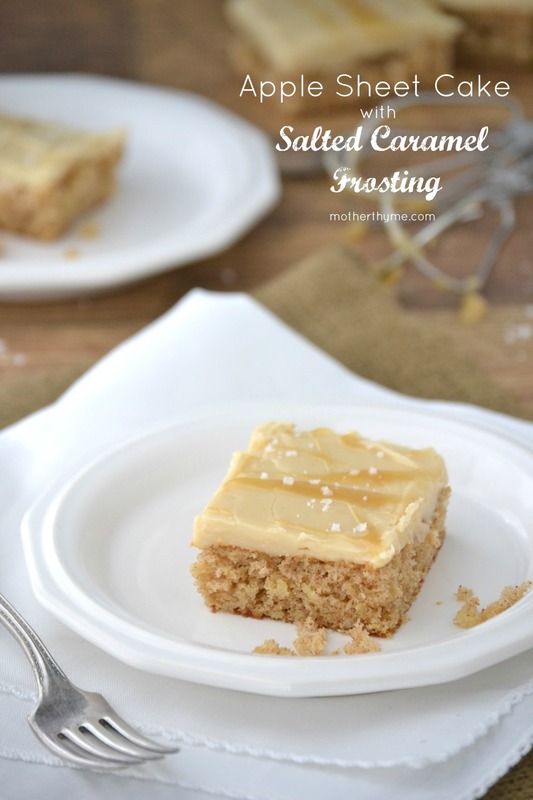 Do you use salted or unsalted butter for the caramel frosting? Very tasty with the frosting. The baking time was closer to 30 min for me, but easy to adjust.